Over the past year, scientists have been keeping a close eye on an important swath of the Pacific Ocean, just along the equator. When conditions here are just right, an El Niño can form — and wreak havoc on weather patterns across the globe. And right now, it looks like we’re on pace for a very large El Niño this fall or winter. Quite possibly one of the strongest on record. Based on past experience, that could potentially bring much-needed rain in California, but also drought in Australia, destructive floods in Peru, and so on. 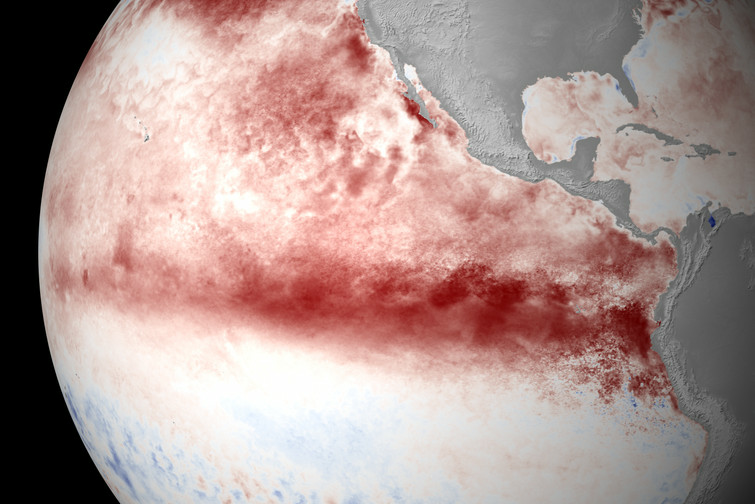 A strong El Niño could also help make 2015 and 2016 some of the hottest years ever recorded. It’d be a very big deal. But El Niño events are often unpredictable and full of surprises. So nothing’s guaranteed just yet. What follows is a guide to how El Niño works, what we know about the 2015 event, and how a potentially massive El Niño could upend the world’s weather later this year. El Niño is a weather phenomenon that occurs irregularly in the eastern tropical Pacific every two to seven years. When the trade winds that usually blow from east to west weaken, sea surface temperatures start rising, setting off a chain of weather impacts. El Niños can be strong or weak. Strong events can temporarily disrupt weather patterns around the world, typically making certain regions wetter (Peru or California, say) and others drier (Southeast Asia). Some countries suffer major damage as a result. El Niños also transfer heat stored in the deeper layers of the ocean to the surface. When combined with global warming, that can lead to record hot years, as in 1998. That, in itself, is a surprise. Back in March, NOAA’s Climate Prediction Center announced that a weak El Niño had formed in the Pacific, but many experts initially thought it might just fizzle out in the summer. Instead, El Niño kept getting stronger, with ocean temperatures in the eastern tropical Pacific continuing to soar. Some forecasters now think this could turn into one of the strongest El Niño events in memory when it peaks later this fall or winter. “We’re predicting this El Niño could be among the strongest El Niños in the historical record, dating back to 1950,” said Mike Halpert, deputy director of the Climate Prediction Center, in a recent press call. We’ll see if this latest forecast holds up. If it does, countries across the globe will have to brace themselves. In the past, major El Niño events have brought unusually hot, dry weather to Australia that can cramp wheat yields and amp up wildfires. It can bring hotter, drier weather to India that hurts agriculture. It can bring heavy rain and destructive flooding to Peru, washing away houses and spreading cholera. In 1997, El Niño dried out Indonesia so badly that it led to huge forest fires whose smoke disrupted daily life in Singapore. Yet El Niño isn’t all bad. In the United States, it could potentially bring needed rain this winter to ease California’s drought (though also mudslides and flooding). Historically, El Niño has also served up milder US winters and helped tamp down hurricanes in the Atlantic Ocean. Another story to watch is whether a strong El Niño could help make 2015 or 2016 the hottest year on record. This one seems increasingly plausible. Bottom line: There’s still a lot of uncertainty here, but El Niño could very well be the biggest weather story of late 2015, with potentially far-reaching impacts. As a result, during “neutral” conditions, sea levels are about half a meter higher near Indonesia than they are in Peru. And the surface water near Indonesia is about 8°C warmer (14.4°F) than it is near Peru. That temperature difference creates a convective loop in the atmosphere that, in turn, reinforces the trade winds. This ends up affecting a lot more than just this stretch of ocean. Because the Pacific is so vast, this system is a major driving force in the global climate. The large, warm pool of water near Indonesia causes the air above it to rise, creating rainfall in the region. And this system shapes the jet streams that guide weather and storms around the world. That’s how it works under normal conditions, anyway. But things look a little different when El Niño comes along. This causes sea surface temperatures in the east and central Pacific to start rising and the trade winds to weaken even further. What’s more, rainfall starts following that warm pool of water as it travels eastward. That’s why El Niño is usually associated with drier weather in places like Indonesia and Australia, as well as heavier rains in places like Peru (or California). The rain is essentially moving east. Scientists officially declare an El Niño when sea surface temperatures in the equatorial Pacific Ocean (known as the Niño 3.4 region) rise 0.5°C above their historical baseline for three months in a row — and once atmospheric conditions and rainfall patterns shift accordingly. A strong El Niño can weaken monsoons in the Indian Ocean, for example. It can also cause the jet stream to start stretching from the Eastern Pacific across the southern United States, bringing rainfall and storms with it. Still, a lot depends on how strong the El Niño actually is — and occasionally there are aberrations and exceptions to the rule. More on that below. Ever since early 2014, scientists have been expecting this latest El Niño to form. But, in a sign of how slippery the system can be, El Niño kept defying predictions and not showing up. Sea surface temperature departures from average (based on 1981–2010) at the end of February 2015. NOAA map by Emily Becker, Climate Prediction Center. At the time, however, NOAA’s forecasters said that this El Niño looked “weak,” with possibly minimal effects on global weather patterns, and only had a 50 to 60 percent chance of lasting through the summer. As noted above, El Niño tends to be associated with changes in weather patterns around the world, especially during the Northern Hemisphere winter. The most tantalizing possibility is that a strong El Niño could bring rain to California, potentially alleviating the state’s drought. But even here, nothing is yet assured. El Niño only affects US weather indirectly, by altering atmospheric circulation and shifting the North Pacific jet stream. (See here for a lucid explanation by Columbia University’s Anthony Barnston.) This is an intricate chain of events, and small kinks at certain points can affect the ultimate outcome. In other words, thanks to El Niño, California has a greater chance of more precipitation this winter, but not a 100 percent chance. What’s more, even if rain does come, that may not be enough to completely erase the massive water deficit that California has built up over the past five years. The state likely needs record precipitation to end the drought, and it also needs the right mix of rain (to recharge the reservoirs) and snow in the Sierra Nevada mountains (to melt during the spring and summer). Also, be warned: Heavy rain after a drought can bring floods and mudslides. So California needs to be ready for some negative impacts, as well. It’s not quite right to say that El Niño events are “bad” or “good.” They tend to have different impacts on different regions. One recent study from the University of Cambridge found that on average, El Niño events hurt economic activity in Australia, Chile, Indonesia, India, Japan, New Zealand, and South Africa. The reasons varied: drought and reduced crop yields in Australia and India, forest fires in Indonesia, less-productive fisheries in Peru. But that study also found that on average, El Niño tends to boost the economies in Argentina, Canada, Mexico, and even the United States, at least in the very short term. Again, many factors were at play: In addition to bringing needed rain to California and Texas, El Niño was associated with less tornado activity in the Midwestern United States and fewer hurricanes in the Atlantic Ocean. Again, every big El Niño is different and has its own idiosyncrasies. So think of this table as more a rough guide than gospel. So what’s going on here? As humans load more greenhouse gases in the atmosphere, we’re trapping more and more heat on the Earth’s surface. But more than 90 percent of that extra heat is absorbed by the oceans. So subtle interactions between the ocean and the atmosphere can make a big difference for surface temperatures. When conditions in the Pacific are neutral, more of that heat is trapped beneath the ocean surface. 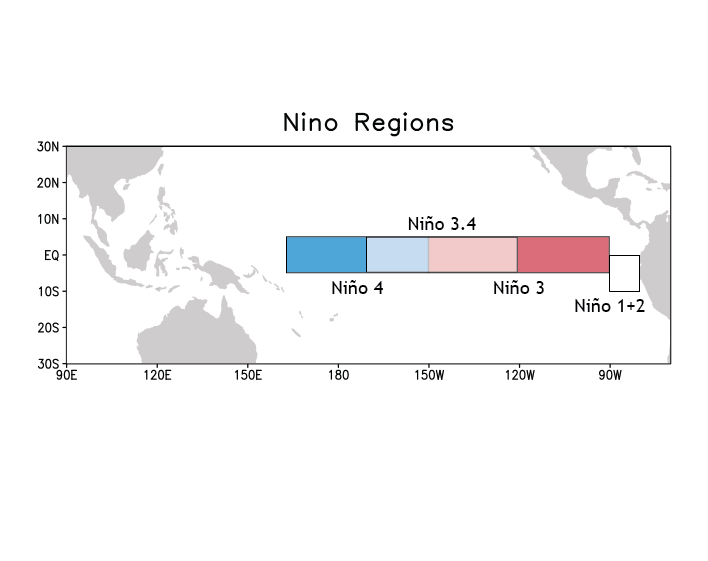 When a strong El Niño forms, more of that heat is transferred to the surface. That’s why the Earth’s average surface temperatures reached new highs in 1998: you had the combination of global warming and an extremely strong El Niño. What was remarkable about 2014 is that it was likely the hottest year on record even without an El Niño event — a sign that Earth keeps getting warmer overall. Meanwhile, 2015 has so far been on track to be even hotter than 2014. Now throw a potentially record-setting El Niño into the mix, and we’re looking at a potential shattering of records. Back in January, NASA’s Gavin Schmidt explained at a press conference that temperatures typically peak about three months after an El Niño event. Given that forecasters expect this current El Niño to last until next spring, it’s entirely possible we could see 2015 or 2016 break the temperature record. We’ll have to wait and see.